Grant Gustin in his first season costume. Photographed by Dean Buscher. Barry Allen travels to Star City to investigate a superhuman-related crime in hopes that it is related to his mother's murder and to meet his vigilante idol, the Arrow (Oliver Queen). He helps Oliver and his team to begin uncover the Mirakuru plot orchestrated by Slade Wilson. After returning to Central City, he gets struck by lightning which puts him in a nine-months coma and becomes The Flash. Barry Allen's first appearance on The Flash is in the episode "Pilot". Barry is introduced as quite a goofy and kind character, who is quite brilliant at his job as a crime scene investigator for the Central City Police department. His obsession for the particle accelerator and interest in Harrison Wells began before his superhuman abilities. After the explosion that consequently led to Barry being struck by lightning, he wakes up and discovers that he has developed meta-human abilities, in particular the power of speed. 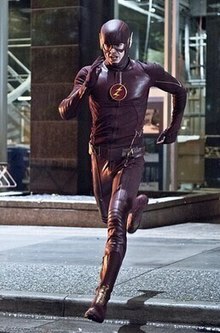 This season portrays Barry's development in his superpowers, he has his setbacks in the beginning, in "Fastest Man Alive" he begins fainting, which he only finds out later that it is because his body is burning more energy than he could intake. Throughout the episode, Barry's character develops and he is able to better control his powers through training at the S.T.A.R Labs, with his team the STAR team: Caitlin Snow, Cisco Ramon and Harrison Wells. Barry's once platonic (at least to Iris West) relationship with Iris is turned complicated after the episode "The Man in the Yellow Suit" when Barry confesses his love to her. In the episode "Crazy for You" however, Barry begins a relationship with Linda Park, who in the next episode suspects that Barry is still in love with Iris West. Season two introduced to a new villain, Hunter Zolomon who is from Earth-2 and was the enemy of the Earth-2 Flash, Jay Garrick. Jay becomes an important mentor for Barry, but in fact, he is Hunter Zolomon / Zoom an evil killer who had misused a drug that made him terminal, which meant his only chance of survival and to regain his speed was to befriend Barry and steal his speed. Both sides of Hunter Zolomon had a great impact on Barry's character, Garrick, an older and experienced mentor and Zoom, the villain who made him choose between his speed and Wally West’s life. This was a true test of character for Barry and depicted that his powers have not changed the kind-hearted person he was. This season featured both different and familiar chemistries, Barry begins first dating Patty Spivot but then after her departure, Barry returned to old flames. Iris reciprocates the feelings Barry has for her, but due to Henry's death, Barry had to choose to alter history consequently changing the storyline of Iris's love for him. This season began with a new reality identified as Flashpoint, in this reality, Barry's mother was not murdered as Barry had run back in time to save her. In this season Barry's character is faced with a vital moral dilemma, he has to choose either to save his friends who are not doing so well in this reality or to keep living in this timeline where his parents are alive. He chooses to ask Eobard Thawne to go back and murder his mother again in the hopes of restoring his original timeline. A new reality is created again due to Barry's changes in history and the timeline, this resulted in the death of Cisco's brother and Caitlin gaining frost powers. The team at first distrust Barry for these changes but forgives him after they have to team up to fight Savitar. The season ends with Barry sacrificing himself and places himself in the speed force prison. Team Flash rescues Barry out of the speed force prison and Barry is given a new suit. Barry and Iris attend couples therapy in attempts to mend their relationship. Barry and Caitlin are kidnapped by two different people and the team has to choose who to save, Barry ultimately escapes and the team are seen celebrating at the West House. Barry, however, is then framed and arrested for the murder of DeVoe, he is then deemed guilty by the jury and sentenced to life in prison. Barry and Iris are back together but Barry is still in Jail. Barry is released from prison after Ralph shapeshifts into DeVoe and appeals Barry's case. The season ends when Barry and Iris discover that the mystery girl who appeared throughout the series is, in fact, their daughter from the future. Team Flash is introduced to Barry and Iris's daughter, Nora West Allen. Barry learns from Nora that in the future he did not return and she had only known Iris. Barry is introduced to a new villain, Cicada, who is a meta human serial killer.. However, in an attempt to defeat Cicada in “What's Past Is Prologue”, Barry and Nora travel back to time and Nora learns that Eobard Thawne killed her grandmother. It is also revealed at the end of the episode that Nora works with Thawne and he sent her back to time to meet her father. Barry and Iris eventually learn their future daughter's alignment with the Reverse-Flash through one of Harrison Wells' parallel universe doppelgängers Harrison "Sherloque" Wells' discovery; they feel betrayed by Nora with Barry bitterly imprisoned his daughter in the pipeline before sending her home now knowing that he cannot trust her. He is also glad to see that Thawne is serving capital punishment for his crimes in the future. He was also interviewed for the Emerald Archer documentary seen in the seventh season Arrow episode of the same name. Barry's suit is altered and upgraded every season. The suit is designed by Cisco Ramon and its original design was intended as a uniform for firefighters. The suit was a modernised version of the traditional flash suit with a matching dark maroon colored helmet, which features the same maroon emblem and gold lightning symbol as the suit does. The second season suit made minor changes to the suit, the alteration being the background color of the emblem is now white with a gold lightning symbol which is more true to the comics. Besides the alteration of the emblem in season 2, there appears to only minor changes made throughout the three seasons. The suit in season 4 appears to be a brighter red, with added leather paddings and golden accents. The fifth season made one of the most significant changes, that is the removal of the chin strap and switching the fabric softer more body fitting look, created by Ryan Choi, in the future. Barry and Iris's relationship has often been compared to Superman and Lois Lane, she is introduced as his one true love. Barry and Iris were close friends since they were 10 years old, this friendship escalates after Barry's mother is murdered and Barry is adopted by Joe West (Iris's father). It is revealed in the first season that Barry is in love with Iris while Iris still sees him as more of a brother. It is later shown that a newspaper article is written by Iris West-Allen in 2024, thus indicating their future romance and marriage. Iris and Barry's relationship changes due to alterations of the timeline when Barry time travels, however, their love seems to always prevail and they are eventually married, Barry says in his wedding vowels "That's you. You’ve always been there, as a friend, as a partner, as the love of my life. You’re my home, Iris, and that's one thing that will never change.". The end of season 4 reveals that Iris and Barry have a daughter named Nora in the future. Barry dates Linda Park briefly in the first season, who is both friends and colleagues at the Central City Picture News with Iris West. Their relationship slowly dies out as she suspects him to still be in love with Iris, they eventually break up and decide that they are better of as friends. Barry and Patty Spivot begin dating in the second season, she was much like Barry with her quirky personality and sad past, that has caused them to dedicate their lives and careers to avenging and seeking the truth about their parents. Patty made the decision to end the relationship as she needed to attend Midway City University and study to become a CSI agent, which meant she had to leave Central City and consequently Barry. Before leaving she had one final case with Barry, in which she tells Barry "I know you’re upset but I was hoping it wouldn't be like this between us". The character's Earth-2 version (also played by Gustin) is a non-metahuman who is a CSI at the Central City Police Department and a PhD graduate that's married to Iris but despised by Joe. Originally, Marc Guggenheim confirmed in an interview that Blitzkrieg seen in Freedom Fighters: The Ray is the Earth-X doppelgänger of Barry Allen. However, much of the concepts for Earth-X has changed since the interview and the animated series' production started, with characters such as Black Arrow and Dark Arrow becoming different despite the original intentions. As such, it is unclear whether this information is still relevant to the character Blitzkrieg. He is voiced by Scott Whyte and is a amalgamation of Baron Blitzkrieg, Baroness Blitzkrieg, Blitzen and Nazi Flash. The character's Earth-90 version is played by John Wesley Shipp. Gustin also portrays Savitar (voiced by Tobin Bell in his exosuit which is performed by stuntman Andre Tricoteux), an evil and scarred future version of his character who is season three's main antagonist. Savitar is essentially Barry with no loved ones and embracing his dark side. Savitar's origins are a predestination paradox; he is a temporal duplicate of the Flash's future self using time travel in order to defeat Savitar. Although Savitar is ultimately defeated, the time remnant is spared but shunned by the rest of his friends and family for being an aberration. As a result, he goes back in time to set in motion the events that lead to his own creation, including the death of Iris. Savitar's presence is "chronologically" the multiverse's first metahuman with speed. Naming himself after the Hindu god of motion, he is worshipped by his own cult. Long-held myths referenced Savitar throughout the multiverse with even Jay believing these stories, and with Savitar regarded as a worst nemesis than the Reverse-Flash, Zoom and the Thinker. From his prison, Savitar manipulates Julian Albert into acquiring the Philosopher's Stone, through which Doctor Alchemy can re-empower metahumans from the Flashpoint timeline. After manipulating Kid Flash into freeing him from his prison Savitar next convinces Killer Frost to be his personal enforcer. When Savitar reveals his true identity to Barry, it forces his younger self to confront his own dark impulses and temptations that plagued him. Savitar's plan of Iris' murder before Barry (which would lead to his own creation), however, is ruined with the sacrifice of H.R. Wells (Earth-19) by impersonating Iris. To save himself, Savitar manipulates Vibe to fragment himself throughout all of time and then goad his original self to give into dark impulses as Savitar himself. However, both efforts are foiled by Team Flash and Savitar is erased from existence after being shot by Iris. In season five, Savitar has a cameo appearance when Barry and Nora time travel to season three and observe his final battle. Grant Gustin as Barry Allen has received positive reviews by both fans and critics, with The Flash being the most watched show in The CW history. Since the premiere of The Flash, Gustin has been nominated for 20 awards for his role as Barry Allen and had won a total of 5 of them. In 2015, Gustin won the Teen Choice Award for "Breakout Star", in that same year he won the Saturn Award for "Breakthrough Performance" and was nominated for "Best Actor on Television". In the following year Gustin won the Teen Choice Awards for "Choice TV Actor: Sci-fi/Fantasy" and in 2017 and 2018 he took home the Teen Choice Awards for "Choice TV Actor: Action". Gustin's Barry Allen has been said to be the better Flash, compared to Ezra Miller who starred in the Warner Bros. Justice League. According to Nick Mangione from Geek.com, "By the time Ezra Miller made his brief cameo appearance in Batman v. Superman, we had already seen the perfect Barry Allen", he goes on to say "More than heart, more than a perfect embodiment of the character from the comics, Grant Gustin is the one true Barry Allen because his show allows him to be. At least at this point, the same can't be said for Miller and the DCEU." While the first season received a large number of positive reviews, the latter seasons received more mixed reviews. Erik Kain a senior contributor on Forbes indicated that "The first season of 'The Flash' on the CW remains one of my very favourite seasons of a superhero show. I maintain that it's among the best ever made, with great characters and one of the most intriguing villains on TV.". Kain, however, also states that the show has gone downhill and that "Miller's Barry Allen is better in almost every way than Gustin's, though that's largely because he's not weighed down by CW melodrama.". ^ "Best TV Hero – IGN's Best of 2015 – IGN". IGN. Retrieved October 17, 2018. ^ "Three Ghosts". Arrow. Season 2. Episode 9. December 11, 2013. The CW. ^ Andreeva, Nellie (November 18, 2013). "CW's 'The Flash' To Do Stand-Alone Pilot Instead Of 'Arrow' Backdoor Pilot Episode". Deadline. Archived from the original on September 19, 2018. Retrieved October 17, 2018. ^ a b c "The Flash Season 1 Episode Guide". Den of Geek. Archived from the original on April 18, 2018. Retrieved October 17, 2018. ^ Weinberger, Aliza. "The Flash season 1 recap". Mashable. Archived from the original on August 16, 2018. Retrieved October 17, 2018. ^ a b c "'The Flash' season 2 recap: Before Flashpoint". Hypable. September 28, 2016. Archived from the original on July 18, 2017. Retrieved October 17, 2018. ^ a b c "The Flash season 3 recap". Den of Geek. Archived from the original on April 5, 2018. Retrieved October 18, 2018. ^ a b "THE FLASH: Season 3 Recap and Review". ComicsVerse. June 10, 2017. Archived from the original on July 20, 2017. Retrieved October 18, 2018. ^ "The Flash season 4 episode 2 review: Mixed Signals". Den of Geek. Archived from the original on November 7, 2018. Retrieved October 18, 2018. ^ "The Flash season 4 episode 9 review: Don't Run". Den of Geek. Archived from the original on November 7, 2018. Retrieved October 18, 2018. ^ "'The Flash' Recap: "The Trial of The Flash" – Murder in the First". Collider. January 16, 2018. Archived from the original on March 24, 2018. Retrieved October 18, 2018. ^ "'The Flash' Recap: "The Elongated Knight Rises" – This Campy Stuff Is a Real Stretch". Collider. January 23, 2018. Archived from the original on March 28, 2018. Retrieved October 18, 2018. ^ "The Flash shows his True Colors as Barry takes center stage again". FanSided. February 6, 2018. Archived from the original on November 6, 2018. Retrieved October 18, 2018. ^ "The Flash season 4 finale recap: We Are The Flash goes into the mind of the Thinker". FanSided. May 22, 2018. Archived from the original on November 6, 2018. Retrieved October 18, 2018. ^ a b c "The Flash Season 5 Episode 1 Review: Nora". Den of Geek. Archived from the original on October 10, 2018. Retrieved October 18, 2018. ^ Mitovich, Matt Webb (October 17, 2018). "Team Flash Meets Season 5's Bug Bad: How'd the First Fight With Cicada Go?". TVLine. Archived from the original on November 7, 2018. Retrieved November 6, 2018. ^ "Suit Up: The 25 Best Arrowverse Costumes, Ranked". CBR. February 11, 2018. Archived from the original on November 1, 2018. Retrieved November 1, 2018. ^ "First Look at the Flash in Costume for the CW". CINEMABLEND. February 28, 2014. Archived from the original on November 1, 2018. Retrieved November 1, 2018. ^ "See The Flash's Brand New Season 2 Suit". CINEMABLEND. July 20, 2015. Archived from the original on November 1, 2018. Retrieved November 1, 2018. ^ "Is 'Flash' Star Grant Gustin Teasing New Costume for Barry?". ScreenCrush. Archived from the original on November 6, 2018. Retrieved November 6, 2018. ^ "First Look: The Flash's Season 4 Costume". ScreenRant. September 15, 2017. Archived from the original on November 6, 2018. Retrieved November 6, 2018. ^ Mitovich, Matt Webb (August 10, 2018). "The Flash's New Season 5 Costume: Your Official First Look". TVLine. Archived from the original on November 6, 2018. Retrieved November 6, 2018. ^ a b c d Hawkings, C. J. (October 28, 2017). "6 Things You Might Not Have Known About Barry Allen's The Flash". Medium. Retrieved November 9, 2018. ^ Gelman, Vlada (November 29, 2017). "Arrowverse Crossover Twists: Who Got Married? Plus: [Spoiler] Will Return!". TVLine. Archived from the original on June 4, 2018. Retrieved November 9, 2018. ^ a b "EXCLUSIVE! 'The Flash' Sneak Peek: Barry and Patty's Post-Breakup Tension Will Break Your Heart". Entertainment Tonight. Archived from the original on May 15, 2017. Retrieved November 9, 2018. ^ Abrams, Natalie (February 9, 2016). "The Flash: 13 most shocking moments from Team Flash's trip to Earth-2". Entertainment Weekly. Archived from the original on February 12, 2016. Retrieved February 9, 2016. ^ Agard, Chancellor (December 2, 2018). "Supergirl post-credit scene teases the Monitor's plan in 'Elseworlds' crossover". Entertainment Weekly. Archived from the original on December 5, 2018. Retrieved December 5, 2018. ^ Robinson, Joanna. "How The Flash Finally Fixed Its Iris Problem". HWD. Archived from the original on July 29, 2017. Retrieved November 8, 2018. ^ Staff, Variety (August 17, 2015). "Teen Choice Awards 2015 Winners: Full List". Variety. Archived from the original on January 10, 2016. Retrieved November 9, 2018. ^ "2015 Saturn Awards: 'Captain America: Winter Soldier,' 'Walking Dead' lead nominees". EW.com. Archived from the original on November 9, 2018. Retrieved November 9, 2018. ^ "Hero Complex – Los Angeles Times". latimes.com. Archived from the original on October 3, 2018. Retrieved November 9, 2018. ^ "Choice Party Song – Teen Choice Awards: Winners List". The Hollywood Reporter. Archived from the original on January 7, 2017. Retrieved November 9, 2018. ^ "Teen Choice Awards: Complete Winners List". The Hollywood Reporter. Archived from the original on July 12, 2018. Retrieved November 9, 2018. ^ "Teen Choice Awards: Winners List". The Hollywood Reporter. Archived from the original on August 13, 2018. Retrieved November 9, 2018. ^ a b "No, Justice League, Grant Gustin Is the One True Barry Allen – Geek.com". Geek.com. November 17, 2017. Retrieved November 9, 2018. ^ a b Kain, Erik. "Which 'Flash' Is Better: Justice League's Ezra Miller or the CW's Grant Gustin?". Forbes. Archived from the original on November 9, 2018. Retrieved November 9, 2018.